Everything Changes – The Guide to Young Adult Cancer » Love-Hate Relationship with Over the Counter Meds? Love-Hate Relationship with Over the Counter Meds? I’ve long been afraid of medication, even over-the-counter meds. Since way before my cancer diagnosis, I was scared of what the side effects could do. I opted for just feeling my pain or taking natural remedies instead. But having cancer changed some of that for me. I used to not even take Tylenol for a headache. Now I toss back two extra-strength at the first twinge of pain. I want to nip pain in the bud because A) Feeling pain sometimes launches me into a cancer PTSD anxiety spiral and B) Since cancer I feel like I have filled my life time quota of pain. Why have any more than I need? Without going into huge detail about my bowels, I’ll just say that my doctor wants me to start taking a medication that contains aspertame and might make me feel bloated and crap a lot. (Or it might not.) The sample is sitting on my kitchen counter. I don’t want to take it. And then I laugh at myself. Aspertame is ridiculously benign compaired to the hundreds of milicuries of radioactive iodine I’ve consumed. Can I have made it through cancer treatment and still act like such a wimp about over-the-counter, pink lemonade flavored medication? Indeed, I can. Has going through a serious medical illness changed your relationship to having to take medication? Are you more or less likely to take over the counter pills now? 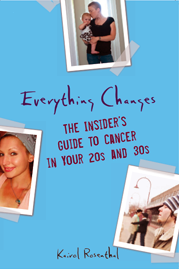 Check out Everything Changes: The Insider’s Guide to Cancer in Your 20s and 30s to learn more about how young adults can manage pain. I’ve never liked taking pills (I blame my anatomy – a narrow throat), but now I have to take so many pills that I try to avoid taking anything that isn’t absolutely necessary (although I make myself swallow B vitamins and calcium which, although not medicinal, still involve ingesting non-food substances). One thing I love taking is Inositol powder, dissolved in water, and I was thrilled to see the recent study that showed it may prevent lung tumor growth. I’ve been taking the stuff for almost 8 years, and each morning when I drink the brew I feel like I am doing something concrete to prevent a recurrence. That, and laughter, are the best “medicines”, in my book! Great to see you back, Kairol. I think you should start a conversation about PTSD Cancer anxiety itself! Its hardly ever mentioned, yet is turning out to be very real. Especially for young adults who had long time hospital stays and experienced life or death situations. I used to be very wary and careful about OTC meds – although extra-strength Excedrine was always my friend where my migraines were concerned. Part of it is that I *hate* swallowing pills, have tried every trick in the book. Oblong gelcaps that are as small as possible are (usually) ok; everything else is touch and go. Now, post-cancer, I am only supposed to take regular strength Tylenol, or a low-powered (200mg) variation of ibuprofen. Aspirin is supposed to be off-limits because I’m at increased risk for bleeding. Tylenol is supposed to be used carefully if at all because it can be liver-toxic, and I’ve had a liver resection. Still – the morning routine includes 1 each of VitC, VitD, VitE, milk thistle, 150mg Zantac, calcium, 600mg Mucinex, and a multi-vitamin, and 2 each of 450mg cranberry extract caps to help with UTIs. 10 pills. Geez. Before cancer, I used to take four pills – multivit, and one each VitC and VitE and 600mg Mucinex. Now I’m some sort of supplementation machine. But two weeks ago in DC, I had a pain flare-up that was just unbearable, and I gave in and bought a two-pack of plain old aspirin at the hotel front desk. Damn the bleeding risk, they didn’t have Tylenol or Ibuprofen and I hurt too much to walk around looking for a pharmacy. It worked, and I bought a second pack for my purse for the 10-hour train ride back to CNY. Hi Peggy, I agree – cancer, PTSD, and anxiety are huge issues that are especially pronounced in pediatric and young adult patients. I have written a lot about this in my book Everything Changes, and also here on my blog. If you scroll down, you will find a search box just above the “hot topics” tag cloud. Posts on the issue will come up if you search for “ptsd” “post traumatic stress disorder” and “anxiety”. I would love to read your comments on those posts! I have always been at the very least “wary” of drugs – OTC or not. My Dad used to have to ingest aspirin every day for his eyesight (something to do with microclotting and vision-occlusion?) and I would bring him his aspirin every morning. I was hooked on caffeine (the ultimate OTC drug, in my opinion) and decided to wean myself of that dependence as well. Then came cancer. I currently take 1000 IU of Vitamin D with my orange metamucil every morning. I will take whatever my trusted oncology team suggests will help to prevent cancer recurrence, and am working to change my diet away from meats (thinking that they are hormone and antibiotic laden). And PTSD is real. Each CT scan or colonoscopy is a slightly traumatic event, because the outcome is not guaranteed to be unremarkable. I also was wary of a lot of OTC meds in the past, only taking Tylenol and avoiding NSAIDs (e.g. ibuprofen or Alleve) even for things that NSAIDs were known to be more effective for, b/c I was afraid (and still am) of the bleeding, GI, and kidney risk from NSAIDs. (Since the liver risk with Tylenol is only at really high doses, it seemed much safer to me.) Then, during and after my work-up for thyroid cancer, I’ve gradually been started on Rx meds, and now it does feel like OTC meds are nothing to be that afraid of in comparison to stuff I’ve been through. I still read the entire OTC label(s) completely (and double-check Micromedex for any drug interactions), but I did find it much less of a deal to start taking additional OTC meds, as long as they were recommended by my doc(s). I just saw recent study on illicit drug use and abuse of non-Rx drugs. It opened my eyes to an entirely other side of the over the counter meds conversation. And made me very grateful that at least my fear of taking them prevents me from going down that path. It also makes me want to write a post about cancer, chronic illness, and abuse of pain killers.